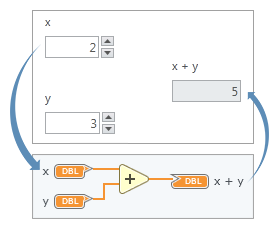 Data in a control flows from the panel to the diagram through a corresponding input terminal. Data in an output terminal flows from the diagram to the panel through a corresponding indicator. The following image shows the flow of data between the panel and diagram of a VI.